Casey Anthony: Why bring those party photos up again? ORLANDO, Fla. -- Judge Belvin Perry may rule Monday on whether some key pieces of evidence will be allowed during Casey Anthony's upcoming murder trial. Anthony's defense submitted a motion for Perry to throw out evidence from the Oak Ridge National Laboratory. Meanwhile, Anthony's defense also submitted a new motion to exclude any reference to photos and the social behavior of their client during the 31 days before Caylee Anthony was reported missing. is this the mug shot photo of casey oh wait this was for the missing person poster for caylee? Bill Sheaffer: Analysis Of Defense Motion Regarding "31 Days"
or go to http://www.amw.com/allstar/2011/vote.cfm?id=9324 to vote. 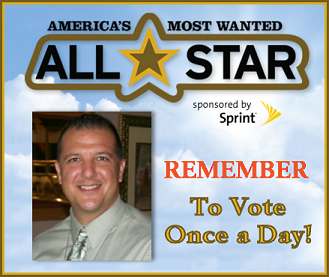 You can vote once a day until May 8. Voting ends: May 8, 2011, 11:59 p.m. EST. Voted first thing this morning. It seems Yuri is in second place. He's number one, in my book! Hoping in the voting days that are left, we Monkeys can move him into first place. Took me dern near one hr to vote with everyone in my contact list!!! Brava loca! Now, that's dedication! Turbo, thank you for your insightful explanation of some of the facets of Aspergers/Autism and I agree the three A's you mention seem to fit. Apparently this is autism month and Dr. Drew had a short segment recently. The most distressing factor I think is the inability to empathize. A doctor that specializes in autism on the show stated that because empathy is not intrinisic she feels that this has to be taught. To what extent it can be learned, she did not say. Unfortunately the segment was far too short and I wish they had devoted more time to it. Ed Asner along with his son and grandchild were on the program. Asner has a son and grandchild that suffer with autism. It seems that these children have an exceptionally sweet quality about them. I would like to know how that ties in with lack of empathy. My son has Asperger's, and he is on the high functioning side of autism. He is extremely empathetic, in some ways, and absolutely clueless in others. From my personal experience, Lee has definite characteristics of Asperger's, but I am leaning toward pysco/socio-pathic diagnoses for Cindy and Casey. George, in my sort-of humble opinion, is just a plain ol' con man. Agree, George is a con...but he didn't con the great Monkeys!!!! George and Cindy want to circumvent the rules, again. The attorney for George and Cindy Anthony filed a motion late Monday asking to be excused from rule of sequestration. we posted same time too funny!! Those votes will probably be disqualified. The judge would be a fool to let them attend. They just want to be there to fine tune their lies when they hear what others have said. Of ALL the people testifying in this case they are the perfect example of why witnesses need to be sequestered. I cannot imagine Judge Perry allowing them to attend. I didnt know because I began doing it because I was told by another site it was allowed!! I will not do it again! shame on me!! Lol! Sindy will probably make Bozo call her first. these people the anthonys have such a sense of entitlement! Page created in 2.282 seconds with 19 queries.